Lack of time: They are working hard in their business and clients come first, often leaving the books for last. This often means organizing books after year end. Co-mingled accounts: Many of these clients do not have separate bank accounts or credit cards that are used exclusively for their business, making it hard to identify business expenses. Limited understanding of deducible expenses: There are expenses these clients don’t realize are deductible, and as a result, do not track the amounts paid. 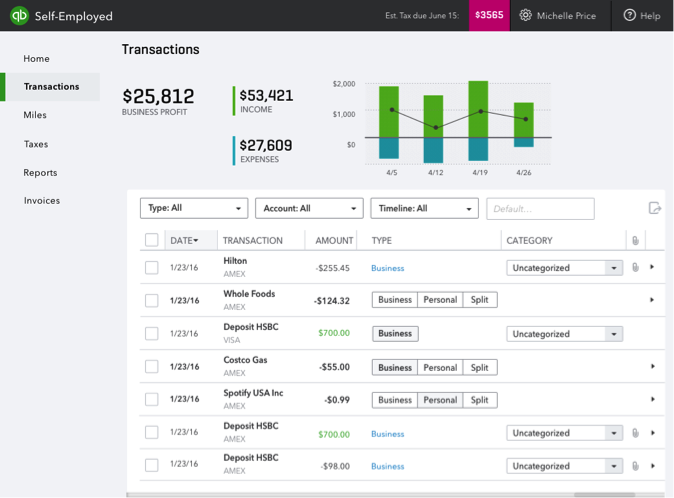 Clients using QuickBooks Self-Employed can connect their bank accounts and credit card accounts to the company file. Connected bank accounts have transactions downloaded automatically from the bank or credit card company. Clients who add their bank accounts will benefit from reduced data entry, and will capture transactions and deductions that may have been missed. If cash or the account not connected to QuickBooks is used, the transactions must be entered manually. Personal: When a transaction is marked Personal, there is no further information needed and the transaction is excluded from the Schedule C. The process is shown below. Business transactions are marked as Business and assigned a Schedule C category. 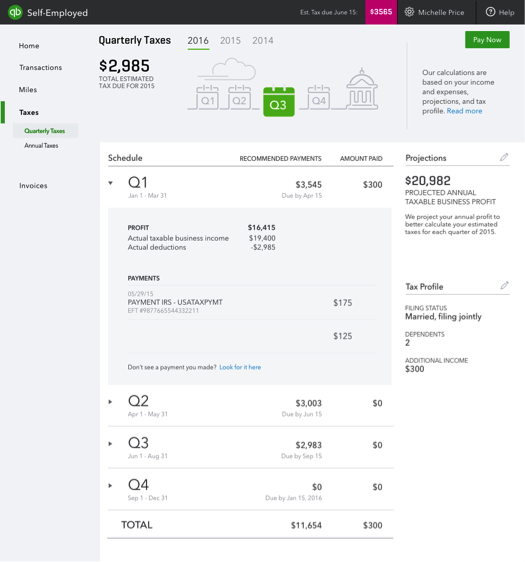 The category list is comprised of allowable line items on a Schedule C. You cannot add or delete categories from this list, but QuickBooks Self-Employment will categorize the most expenses for you. This feature helps business owners who are not familiar with tax law to categorize transactions. It also saves time and improves accuracy. A business transaction is shown below. If the category is blank or you feel it is incorrect, you can click on the category name and see the dropdown list to reclassify the expense. Split transaction designation is used to either allocate part of a transaction as business and the remaining portion to business, and/or allocate a transaction to multiple Business categories. Here is a transaction that is split between Business and Personal expenses. The next example shows the process of allocating a transaction between multiple business categories. For example, if the client is at a gas station, he may have been charged for gas and vehicle repairs in the same transaction. By using the split, shown below, you can record the transaction properly. The last feature you should know about is the ability to create rules for transactions. This feature serves two purposes. It saves time when entering future transactions and corrects multiple transactions quickly if an error is found, or when reviewing all past transactions for accuracy. 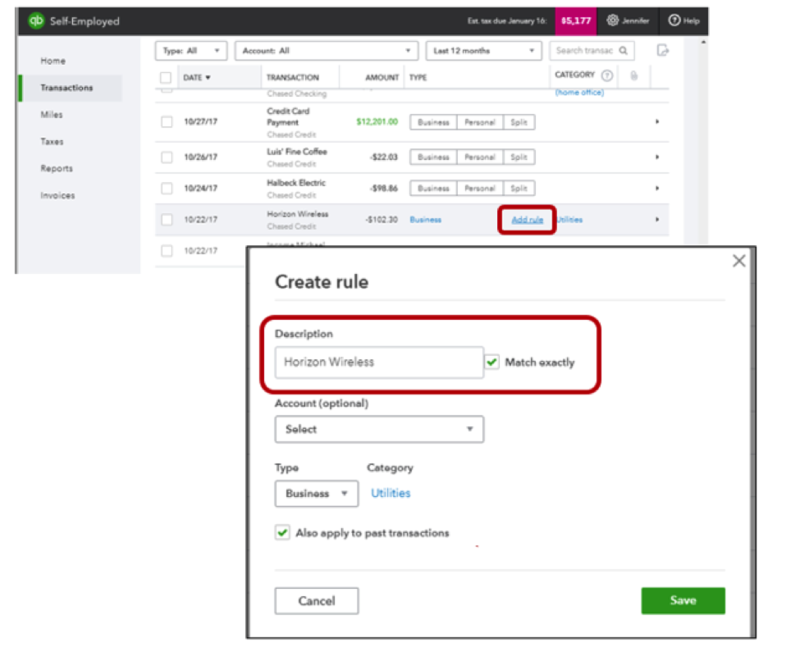 The rules feature is shown in the example below for Horizon Wireless. By hovering the mouse between Business & Utilities, you will see “Add Rule.” Select this option. In the rule screen, you can identify the criteria for the rule, such as the vendor name and identify the category. Below that is a checkbox to apply to all past transactions, if desired. 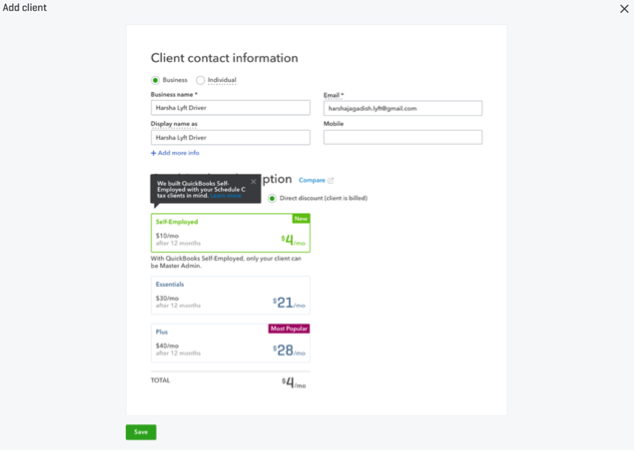 As shown above, organizing clients with QuickBooks Self-Employed can be quick and easy. 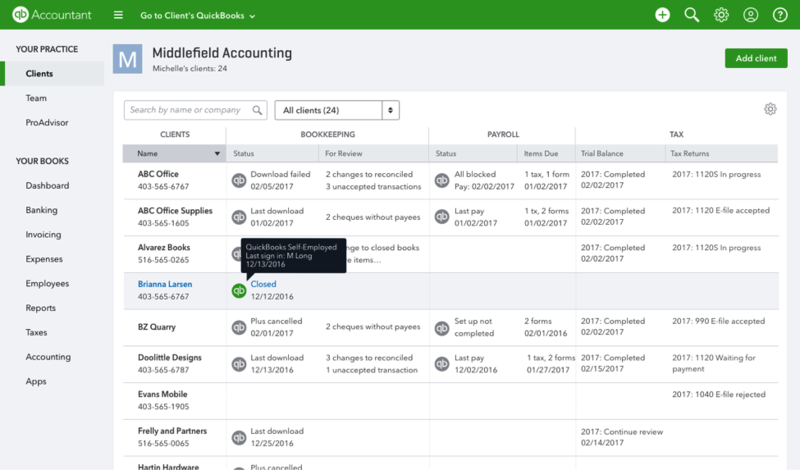 After a client is set up, he can “Invite an Accountant” so that their records can be reviewed using QuickBooks Online for Accountants. Next week, I will discuss how QuickBooks Self-employed maximizes deductions with the mileage tracker and the snap and store receipts feature. 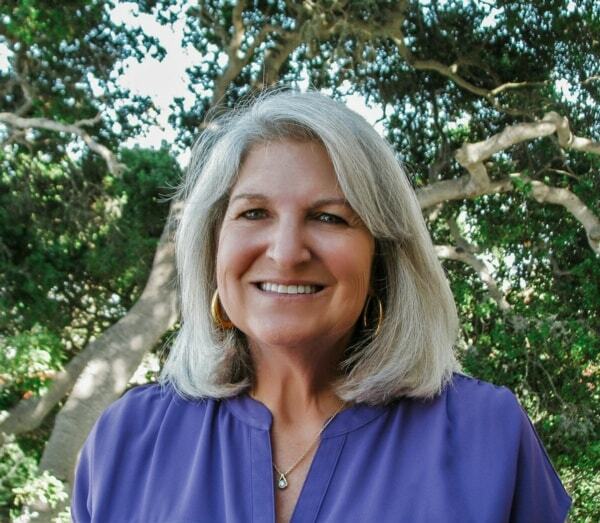 Why Does This Group Matter to Your Practice?